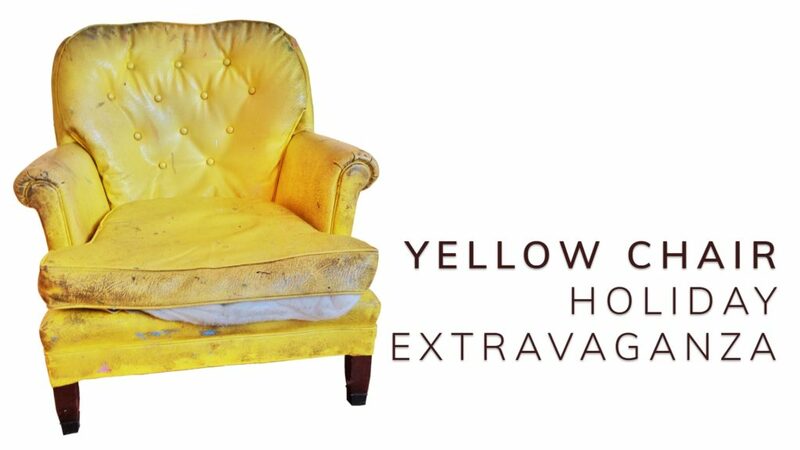 DAVID&SCHWEITZER Contemporary, in collaboration with trans-cen-der art group, is excited to announce YELLOW CHAIR HOLIDAY EXTRAVAGANZA, a benefit show opening December 15, 2017 at DAVID&SCHWEITZER Contemporary, 56 Bogart St in Brooklyn. The show will run through December 31, 2017. Gallery hours are 1p – 6p Friday through Sunday. For many of us in the close-knit North Brooklyn art scene, the battered yellow leather chair in Michael David’s studio has become an object of intense fascination. The chair makes guest appearances at opening receptions, has appeared in the paintings of several different artists, and is a popular site for photos shared widely on social media. The spirit of the chair is weathered and generous, eccentric and welcoming, and has enough personality for its own star turn. We’ve chosen the Yellow Chair as the inspiration for our holiday benefit show, an annual tradition at DSC and a first for trans-cen-der art group. Our YELLOW CHAIR HOLIDAY EXTRAVAGANZA represents the first project to blend the artists of the DSC FLATFILE with the artists participating in the trans-cen-der art group extended community. Displayed work will be curated from the DSC FLATFILE and will also include work from artists who have presented to trans-cen-der during 2017. More than 70 artists will contribute work to the EXTRAVAGANZA drawn from both the DAVID&SCHWEITZER Contemporary and trans-cen-der communities. A portion of proceeds from the show will go to support the work of ACLU and The Committee to Protect Journalists. The YELLOW CHAIR HOLIDAY EXTRAVAGANZA Opening Reception will give participants the opportunity to have their own portrait taken in the Yellow Chair. In exchange for a canned/non-perishable food item, a professional photographer will take a photo of the donor in the famed, war-weary throne. Food items will benefit local food pantries. ABOUT DAVID&SCHWEITZER Contemporary – One of the premiere galleries in Bushwick, DAVID&SCHWEITZER Contemporary is located in the space in 56 Bogart which once housed the venerable Life on Mars gallery. The gallery program is run by partners Michael David and Keith Schweitzer. Mr David is familiar to many as a painter, photographer, punk rock musician, founder of Fine Arts Workshop in Atlanta and director/curator of Life on Mars in Brooklyn. Mr Schweitzer, formerly Director of Public Arts for Fourth Arts Block, is co-owner and director of The Lodge Gallery on Manhattan’s Lower East Side. DAVID&SCHWEITZER Contemporary is committed to creating a dialogue around painting and sculpture, photography and other media, and its continued relevance in the age of new media. ABOUT TRANS-CEN-DER ART GROUP – trans-cen-der art group is an creative community founded by artists Tim Gowan, Meer Musa, and Sharilyn Neidhardt. trans-cen-der hosts a monthly lecture series at Brooklyn Fireproof which provides artists a supportive place to share work, receive feedback and form creative opinions. trans-cen-der sessions are free of charge and open to all.